Production Period: 1892 - ? The Frena is a box camera that contains a special carrier for notched celluloid film sheets, made in a number of sizes and sold in packs of twenty. The origins of the name "Frena" is interesting to note. Channing & Dunn [2, p22] quote that Beck stated that the word came from "For Rapidly Exposing Negatives Automatically". I have not yet found this same definition. Early Frena manuals and catalogues are consistent in identifying an alternate origin to the name. 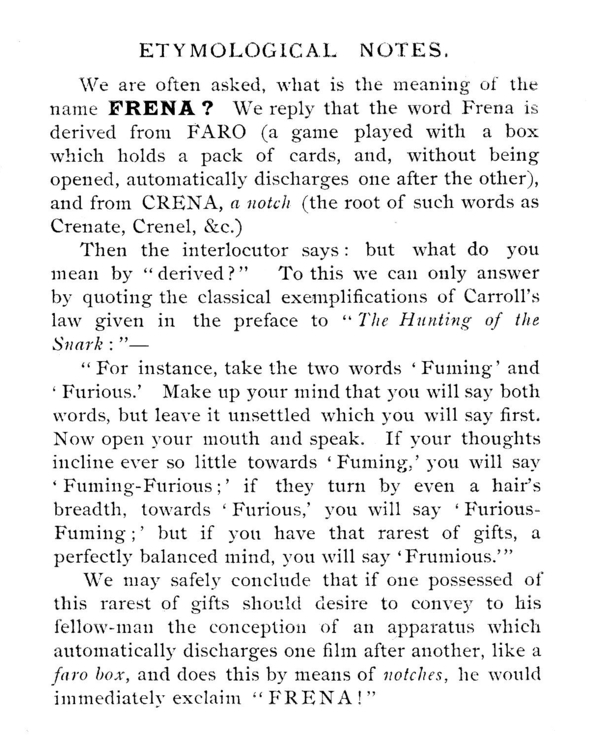 A short catalogue from 1894 states that "... the word Frena is derived from FARO (a game played with a box which holds a pack of cards, and, without being opened, automatically discharges one after the other), and from CRENA, a notch (the root of such words as Crenate, Crenel, &c.)". A scan of the page is available here. This same Etymological Note is to be found in a handbook for a Frena No 22, dating to 1900. Users of the Frena are also blessed with their own title, being referred to in the Beck documentation as "Frenographers". The operation of the camera is rather unusual and not too easy to work out without instructions! Once a picture has been taken, the camera is held with the lens pointing upwards and the handle on the side is rotated alternately clockwise or anti clockwise to operate the film changer. It is essential to point the camera upwards to release a gravity lock on the changing mechanism. Operation of the handle moves a series of pins in the film holder that allow the exposed film to drop away into the base of the camera, to be replaced by the next whose notches are offset and therefore remains held in place by the pins. The camera has a rotary sector shutter. This is set by turning the knob on the front of the camera in a clockwise direction. It is released by the button on the side of the camera. When the shutter is cocked it is possible to change the shutter speed by rotating the toothed wheel that is accessible through an opening in the base of the camera. The wheel needs to be lifted slightly forward before turning. The speed that is set is engraved on the shutter blades and can be seen from the front of the camera. Serial Number: Serial 3381 marked on the handle. The No 1 Frena was identified as such from 1894 but was based on the original model that was first introduced in 1892. This variant took sheet film that was lantern plate in size. Inside the back the camera is marked as "The Frena | Patent | R & J Beck", written within an outline of a sheet film. The camera is in very good order. The leather covering over the wooden body is generally in very good condition, with only minimal marking from use. The strap is intact and in good order. The metalwork is in good condition with only limited brassing. The serial number (3381) and the lack of "Ltd" in the company name (effective from January 1895) suggests that this probably dates to 1894, by which time it would have been identified as the No 1, due to the introduction by then of other sizes. 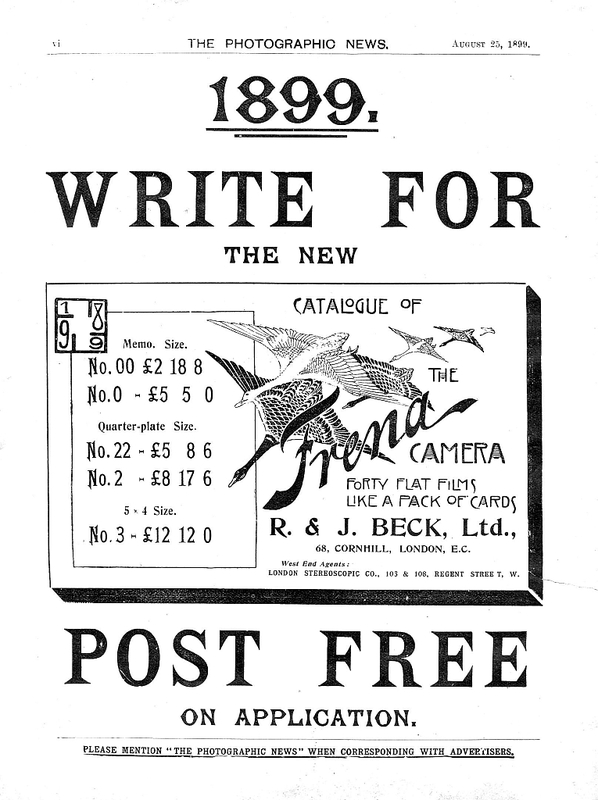 The catalogue that was bought with it is dated January 1895 and marked as R & J Beck Ltd, but quotes that "not less than 3458 Frena Cameras" were in use at that time. This model has a second circular opening on the front that gives access to the shutter mechanism to assist with setting the speed. This is "hidden" by a sliding metal door. Again, this rather suggests a later model as the original model did not have this facility. Initially it was not clear how the shutter operates. Having referred to the manual for the No 22, I was able to work it out! Firstly, the shutter must be cocked by turning the knob on the front clockwise as far as it will go, until a click is heard. Then it is possible to set the desired speed by turning the toothed dial. In the lower window, the edge of the toothed wheel can be lifted slightly to disengage a notch from a pin and can then be rotated the the desired speed. Each speed has a small notch cut into the wheel which engages with a pin. Once the shutter is cocked and the desired speed set, the shutter can be operated. Note that pulling the shutter release out allows timed exposures to be made. The camera was bought on eBay from New Zealand. The seller listed a catalogue and price list separately - I negotiated to buy the two together. Both the catalogue and price list are marked as being provided by a dealer in Auckland, J. R. Gray. Serial Number: No obvious serial marking. The No 2 Frena was introduced in 1894 and took sheet film that was ¼ plate in size. It is difficult to determine the age of the camera. This example has the early swan neck handle design that was used until 1900. The belt handle is intact but dry, and the buckle is very stiff. The leather on this example is in very good condition, with just a few minor dings on the edges. On this example, one viewfinder cover is missing the pin used as an opening handle. The No 0 took sheet film of a smaller size, reducing the size of the overall camera. It is difficult to determine the age of the camera. This size was introduced in 1901, and I think this may be an early model as the finders have no cover and the fastener for the two sections is of a simple form (a sprung U-shape). The belt handle is intact but dry, and the buckle is very stiff. In good order, though unclear whether the shutter works or not. 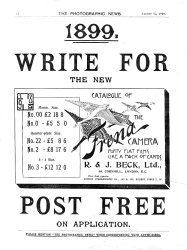 The advertisements for the Frena camera were varied and had some interesting and very attractive artwork. The image at left shows a typical example taken from the Photographic News for 25 August 1899. (Click on the image to open a larger version in a new window). These cameras were evidently made in quite large numbers and achieved wide success in their time. However, surprisingly they do not appear in online auctions that often with perhaps 3 or 4 examples appearing each year. The original model is the hardest to find. The most attractive variants are the Frena Presentation models, which were also available in several sizes.